And as Sharpe looked on this scene of devastation, a cold anger began to brew in his heart. If there was one thing that Sharpe hated, it was waste of life. In his book, an officer had the right to sacrifice his mens lives, but he had no right to throw them away. And that was what had happened here. These men had died uselessly, without any realistic chance of victory. Nothing had been achieved, nothing proven, except for the stupidity of their officers. These men had been thrown in their thousands against the Yankee line, and in their thousands they had been mown down. Uselessly. His old regiment had been hurled against the Jonathans line, and then thrown back bloodied. But they werent all dead. And there was still a chance to save at least some of them. And to save their honor too. 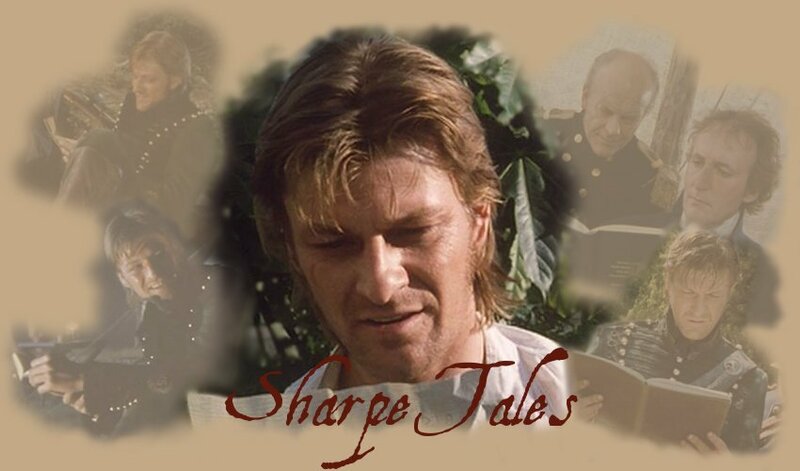 A few days before, Sharpe had watched helplessly as his men died. He was never going to let that happen again. Ever. He didnt have to think about it. He set off across the battlefield, making a beeline towards his old regiment. He no longer felt his injuries. He had to gingerly step around the wounded strewn in his path, around severed arms, legs, heads, torsos and less identifiable fragments. And with every step, his anger increased. The myth of the Redcoats superiority over the Jonathans had been the one reason for Pakenhams overconfidence in the face of mounting odds. The night battle, the reconnaissance in force, the artillery duel, should have dispelled this myth and warned him he was up against veteran frontier fighters. Pakenham had attacked anyway. The battlefield was as flat as a tabletop. The men marching into the mouths of the guns would have had no cover for the weapons full range. Pakenham had attacked anyway. And Sharpe walked on unscathed. Smiley stared after him in astonishment. How in Jehosephats name had he missed at that range? Sharpes lips were compressed in a tight line, but inside he was seething rage. These perfumed gentlemen with their fine uniforms were very good at sending men to die. But if you cornered them and asked what those men died for, it was rare indeed that they could tell you. The question never even entered their minds. "You there, Sharpe! What do you mean by skulking around the battlefield like this? Why arent you with your men? Are you shirking your duty  "
Thortons attack across the river, so crucial to success, had obviously failed. Pakenham had attacked anyway. Even when the soldiers had tried to escape the ramparts murderous fire, their officers had still urged them on, in yet another useless effort. Pakenham had attacked anyway. Across the battlefield, through the drifting smoke, came an eerie,wailing sound, a single bagpipe. Sharpe recognized the tune: "Amazing Grace." He looked where the 93rd had been mowed down without a break in their formation. He could see a mangled, bloody thing that bore little resemblance to the man it had once been, lying against his comrades bodies, working the pipes. The 93rd had been marched straight across the Yankees line at point-blank range, exposed to murderous fire. They never had a chance to shoot back. Pakenham had attacked anyway. Now he was only a hundred yards away from where the Essex lay. They had gone to battle with around eight hundred men. As far as Sharpe could tell, their front ranks, close to three hundred, were almost all dead. Towards the rear of the column lay some four hundred who were unwounded and could march unaided. Mixed in with the living and the dead were the wounded, some just waiting to die, some who couldnt be moved but might live, and perhaps a hundred who could make it off the battlefield if they were helped. That made five hundred men whom Sharpe would save or die trying to save. And it wasnt enough to save their lives. If that were all, they could just crawl off the field on their bellies like so many worms. But if they did that, they would never be worth anything as soldiers again. They would never recover from the disgrace. He had to save their pride, save them in a way that would remind them that they were brave men and that there would be other battles in their future where they could erase this humiliation. They had to believe that they would know victory again. He had to save them with honor. "Now listen up! My name is Major Sharpe. You all know who I am. Im going to get you out of here. And youre going to leave this field as soldiers! The Jonathans are not going to see us run! If you do as I say, you live! Now get to your feet!" Men who had been lying with their faces pressed into the mud looked up cautiously at him, naturally drawn to the reassuring sound of an officers voice. It gave stability to a world that had been turned inside out. He knew what to do. He would get them out of this death trap. Wouldnt he? But still, death was whizzing right over their heads, missing them by inches, and sometimes not missing. They had seen half their number mown down like grass. How could they stand up in the middle of that? A few got off their bellies and onto their hands and knees, but none got to their feet. 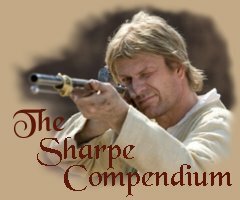 Sharpe saw their hesitation, their reluctance to stand up and make themselves targets for the Jonathans cannons and rifles. He picked out men that he remembered from Spain. "Kirby, remember how you stood and faced down the Crapauds at Talavera! Show me the same stuff now! Peters, we sent them running at Salamanca! This is no different! Now stand and help your mates get up! Horrock, remember, youre a hero of Vittoria. Get up! Sergeant Huckfield, remember Badajoz. This is nothing next to that! Now help me get the lads moving!" Gradually, in ones and twos, the men were getting up, stooping to help their friends to their feet. But it was still too slow. Sharpe needed more help. Then, among the front ranks, he saw it. At Sharpes end of the line, he saw Captain DAlembord. Dally was sitting up, a hand to his bleeding head, dazed. Sharpe ran up to him, gripped his arm and shook him. "Were going to make a fighting withdrawal back to camp. Dally, form the column up by half-companies, and make sure they support the wounded who can walk." DAlembord nodded, turned, and shouted out. Three of them remained, young, scared lads of no more than fifteen in yellow tunics faced with red, their drums hanging from around their necks. They came running up to their Captain, and Price positioned them across the new front rank. Sharpe scanned over the column, saw the Kings Colors and the flag of the South Essex. Two soldiers snatched up the colors from their dead bearers and rushed to the center of the front rank, holding the flags high for all to see. Sharpes voice rang out like a trumpet. Amazingly, in the few minutes it had taken Sharpe to get the South Essex up and moving, the Americans had not noticed them. Smoke had partially obscured them, and the Americans were relaxed, knowing the battle was finished. But the South Essexs period of grace was over. Lieutenant Armande Latois had been a gunner for Napoleon, now he worked for Lafitte, and was leader of the crew manning the brass 18-pound culverin that formed battery no. 7 of Line Jackson. He had found grim satisfaction in shredding the Goddams that had come within his arc of fire, the same troops that had driven his countrys army out of Spain. Now, as the smoke was clearing, he casually glanced across the field of the dead, and started in astonishment. A British column has risen from the dead, and was now heading across the field, flags flying and drums beating! He motioned to his crew. One hundred and twenty muskets rattled out their loads in a dense cloud of fiery tongues and white smoke. Every musket was targeted on battery no. 7. Their numbers compensated for the lack of accuracy. Most of the lead balls ploughed into the mud rampart harmlessly. A few rang and ricocheted off the brass barrel or the wooden carriage. And a very few found living targets among the gun crew. Sharpes command voice rang out in the echoes of the volley. Sharpe could see the charge being rammed down the culverins throat. He raised his sword and brought it down. Again, the South Essex began its progress towards safety. The drums beat their steady cadence. The colors flapped in the breeze. The rear ranks trotted to the front, the new rear ranks faced the American line, muskets at the ready. In the center of the column, the wounded hopped along, their arm over a comrades shoulders. They were beginning to hope. They would make it! But Sharpe, at the rear of the column, saw hope die. They were now a hundred and ten yards from Line Jackson, beyond any chance of accuracy with their muskets. And they had attracted the attention of every gunner in the American line. All up and down the rampart, he could see them loading and targeting his column. Rifles by the hundreds were poking over the mud rim. A crack! sounded from somewhere to his left, and one of the rearmost rankers fell, his mates closing the gap. They were still well within the Jonathans range. There would be no escape. There was no mistaking that voice. Sharpe looked back towards the American line. Riding along behind the rampart was a rider on a white horse. General Andrew Jackson pulled up behind battery no. 7 and raised his arm. All the gunners waited for his command. From across the battlefield, his steel blue eyes lanced out towards the column of the South Essex, their muskets poised, and the bloody figure in a tattered green uniform standing next to its rearmost rank, his sword raised. His eyes met Sharpes, and iron will faced off against iron will. Time seemed to stand still on the battlefield. "General Jackson! This is the South Essex, the finest regiment in the British army! Im taking them out of here, with their colors flying!" Sharpes unspoken meaning was clear. If Jackson tried to stop him, hed pay as bitter a price as Sharpe could exact. He admired courage, even the courage of an enemy. Such bravery as this should be rewarded. And though hed never admit it to any man, he actually liked the British rifleman called Sharpe. His voice carried over the field, and all men heard him. "General, one shot and I can destroy them "
Jacksons legendary wrath blasted forth. "By the Eternal, I am not in the habit of repeating myself, sir! Hold your fire!" "Touch that match and youll not live to see where the shot falls." said Cornelius Kilick. A second pistol pressed into Latois left temple. "And if he misses, mon ami, then I shall not." said Jean Lafitte. "Now drop it, sil vous plait." "Captain Gilpin, you will do me the kindness of seeing that this incident is not mentioned in any report. If word gets out that I let the enemy off scot-free, Id never live it down." "Do you lads know The British Bayoneteer?"
"Harry, youve got a singing voice. Use it, and make sure everyone hears you." "Sing! All of you, sing! Thats an order!" Sharpe knew that the first key to fighting like a soldier was acting like a soldier. And that included singing a soldiers fighting song, even in defeat. First one voice, then two, then five, ten, a hundred, and then almost the whole column was singing for all they were worth, even the wounded as they limped along. "There sir! There he is! Threatened my life he did! If I didnt ride like the devil, I wouldnt be here to tell the tale. I demand Major Sharpes immediate court martial-"
"Captain DAlembord, see to the men. Get them bivouacked, and make sure that they have some hot food. And get the wounded to hospital." "Sir!" then to the column "Column, forward march!" The South Essex proceeded towards their bivouacs, still singing the "British Bayoneteer." Sharpe headed towards the 95ths bivouac. Colonel Mullens watched him go, open mouthed. He turned to Lambert. "Hold your tongue sir! You would do well to start preparing your defense for your own court martial. Im sure well all look forward to your explanation of why you and your troops were not in place with the ladders and fascines as you were ordered to be! As for that man, he has salvaged whatever honor the British army shall have today by withdrawing those troops in good order." Mullens lapsed into an abashed silence, while Lambert looked after Sharpes receding form and shook his head in admiration. Sharpe had drained the last dregs of his strength. Every step was an effort of will, every movement brought new agony. His breath came in labored gasps, and the day seemed to be growing dimmer as the ringing in his ears increased with every heartbeat. But he couldnt collapse, not yet. There was still one task to perform. He came to the 95ths bivouac. Fredrickson was laid out near where he had fallen, with two riflemen standing guard. Sharpe staggered over and stood before his body. In death, his friends face had a look of peace in it that Sharpe had never seen before. He kneeled down and put his hand on Fredricksons cold forehead. Neither of the guards heard what he whispered. He then removed something from his tunic and placed it in Sweet Williams stiffening right hand. He turned to one of the riflemen, gesturing to the body on the ground. "See that hes buried with that." Gripped in Fredricksons fist was a scalp, still fresh and bloody. A scalp shaven bare, except for a crest running down the center. A crest of flame red hair.